By a / December 3, 2011 / . The Pittsburgh Biennial at Miller Gallery is a visually and conceptually stunning exhibition that reinvigorates awareness of the problems that afflict the world today. Through its redefinitions of place and space and trespassing of disciplinary boundaries into economics and science, the biennial contributes to the larger conversation going on within the major currents of contemporary art as defined by [Terry] Smith: global connectivity, environmental issues and the effects of media. Part of the strength of this collection of works is its demonstration that art can not only visualize the problems we face on a global scale but can also inspire political participation and even further the critical dialogue about the role of art itself. Perhaps the artists’ commitment to collaboration, to working with others and negotiating their personal visions, is what makes this group so attentive to the infinite forms of interdependency that defines twenty-first century life—from gender and public/private domains, ecological sustainability, urban planning, the cultural commons and the political imagination. ROCHESTER, New York— In his new book, Contemporary Art: World Currents, Terry Smith argues that three concerns dominate contemporary art: (1) world-picturing, or the imagination of global interconnectedness, (2) environmental problems and awareness, and (3) the effects of social media. On a recent trip to Pittsburgh, I had the opportunity to hear Smith, who teaches at the University of Pittsburgh, speak about these “currents” of art created since the 1980s. When I visited Carnegie Mellon University’s Miller Gallery later that day to review the Pittsburgh Biennial, Smith’s ideas were fresh in my mind and I found myself comparing the exhibition to his understanding of art history. The Pittsburgh Biennial is a city-wide event, taking place in multiple institutions, including The Andy Warhol Museum, Carnegie Museum of Art and Pittsburgh Filmmakers/Pittsburgh Center for the Arts. Some exhibitions began last summer and others, like the show at the Miller Gallery, extend into the winter. The exhibition at Miller Gallery, curated by gallery director Astria Suparak, features five artist-teams, all with some connection to Pittsburgh. Although the Biennial’s publicity describes the show as an exploration of the art of collaboration, I found concern about space, place and the planet to be another significant thread weaving the works together. Each collaborative asks the viewer to re-picture the interconnections that make up our experience of the world — to borrow Smith’s terminology. For Smith, this impulse involves the representation of cultural and economic networks on a global scale. The artists at Miller Gallery, however, focus on a wider range of intertwining relationships, spanning not only the global but also ecological, local, urban, public and domestic spaces. Miller Gallery is divided between three floors, and as I entered each, I was struck by the extent to which the artists redefine each story with a distinct mood. The first floor seems to call for a cheerful reading experience. Artist-team Temporary Services arranged the colorful books of its Self-Reliance Library on attractive blue shelving and exhibited bold quotations created from woven shopping bags, part of the collaborative’s Personal Plastic project. Temporary Services’ contribution to the show’s exploration of space is the architecture of the imagination: turning garbage into a canvas, providing the creative resources for a new way of life. The installation blends Smith’s two currents of contemporary art: world-picturing and environmental concerns, extending them into the space of creativity and the mind. The installation’s visual optimism, however, belies some unsettling questions. The Biennial program reports that with Self-Reliance Library the artists hope to “provoke the reader, solve creative problems, or suggest imaginative directions.” Visitors are encouraged to browse the books and return them to the shelf without taking them home — an obviously necessary act ensuring the library’s and the artwork’s long-term survival. And yet, it is ironic that a library of rugged independence and DIY practices (titles include Pioneering in the Urban Wilderness and The Convict Cookbook) must act more like a rare manuscript library of special treasures. I was struck by the juxtaposition of the scarcity of resources for modern survival and the ubiquity of plastic bags. On a whim we can all find some discarded plastic — just look in your recycling box — but how do we find the tools for self-reliance if they are so precious? This contradiction does not detract from Self-Reliance Library but rather is part of its strength. The ecological crises we face today present daunting challenges, and too often critics and activists resort to a sort of naive hope. Instead, “Self-Reliance Library” suggests a much more complicated representation of the problems we face in creating a sustainable society. As the elevator opened onto the second floor, I was struck by the complete change in Miller Gallery’s atmosphere. Justseeds transformed the space into a highly mediated night-time environment. The proliferation of billboards are distracting, overpowering, mesmerizing — I felt like I was in a version of Time Square, albeit a more beautiful, intimate, utopian version. Rather than images deployed to channel our desires toward credit cards and shopping malls, the artists’ prints display empowering messages, enlightening info, political critiques and gestures of love and peace. Such as “Imagine No Borders.” Or an image of America as a vulture. Or barbed wire fencing hiding a shadowy slogan: “A Billionaire Stole Your Job, Not Migrant Labor.” The installation lead me to ask, what if this gesture were deployed across the country? What if Justseeds’ artistic advertisements were installed instead of the flashing signs we see for car dealerships, HMOs and fast food? Just beyond the billboards, Transformazium’s recycled bricks from downtown Pittsburgh buildings lay in stacks and piles, alongside the tools required to participate in what the team calls its “deconstructive” work. An instructional video on brick-cleaning resonates through the gallery in an ambient sort of a way. Together with the chaotic series of billboards, Transformazium’s audio reminded me of Smith’s third current of contemporary art: the effects of media. Both collaboratives coupled their activist work with an engagement with the need to rethink and re-appropriate the media we encounter in our everyday lives. On the third floor, SubRosa’s “Feminist Matter(s): Propositions and Undoings” and Sarah Ross, Ryan Griffis and Lize Mogel’s “Global Cities, Model Worlds” produce a sparse, studious environment. SubRosa revisits Virginia Woolf’s early twentieth-century suggestion that “tea-table thinking” would be an effective antidote to the male-driven “war-mentality brewed in boardrooms and command centers.” Redeploying Woolf’s idea toward the rethinking of the traditionally male-dominated discipline of science, the artists create an installation that brings traces of the science laboratory to the intimacy of the kitchen table, bringing the public domain into a traditionally private, female space. As I sat at the tables, I enjoyed the visual experience of teacups, tablecloths and beakers side by side, and I reflected on how drinking tea with some friends while experimenting with chemistry might shake up the hardened boundaries of scientific training. However, despite being an avid tea drinker, I felt out of place at the formal tables. Since Woolf’s hundred-year-old vision of feminine domesticity, a lot has changed: popular conceptions of gender and sexuality have been queered; women work in science, “boardrooms and command centers”; men occupy domestic spaces. In addition, science today is not symbolized by glass beakers so much as artificial intelligence, machine-vision, bioengineering and nanotechnologies. I wonder what Feminist Matter(s) might look like if SubRosa were to adapt more contemporary, twenty-first century images of gender, sexuality and scientific practices. Ross, Griffis and Mogel’s Global Cities, Model Worlds displays their extensive research into the harsh realities of mega-events, “large-scale sporting or cultural events that have major implications for host cities,” such as the Olympics, World’s Cup and World’s Fairs. The installation creates an alternative history of what really happens when these events come to town — that is, when we break through the ideological hype of technological and economic progress. The artists adeptly show how mega-events are actually organized in the interests of lobbyists and corporations, ultimately displacing vulnerable city populations in the name of urban development and exacerbating already existing inequalities. During my time at Miller Gallery, I spent the longest time with Global Cities, trying to read all the written text — an uncommon amount for a visual artwork. The artists have defined terms, outlined history, drawn timelines and constructed charts. The information was so profuse I had trouble taking it all in, and I wished I could have either taken the work home as a book or engaged it through some participatory interface. For me, Ross, Griffis and Mogel’s installation was illuminating but also presented questions about the relationship between visual arts and scholarly research. How do artists translate social science into aesthetic form? How to convey vast amounts of data in a way that does not only inform viewers but also engages them in a system of artistic play? After SubRosa welcomed me to sit at its tea-tables, Temporary Services encouraged me to read its books and Justseeds invited me to walk through an alternative landscape, I felt relegated to a relatively passive role with Global Cities. The Pittsburgh Biennial at Miller Gallery is a visually and conceptually stunning exhibition that reinvigorates awareness of the problems that afflict the world today. 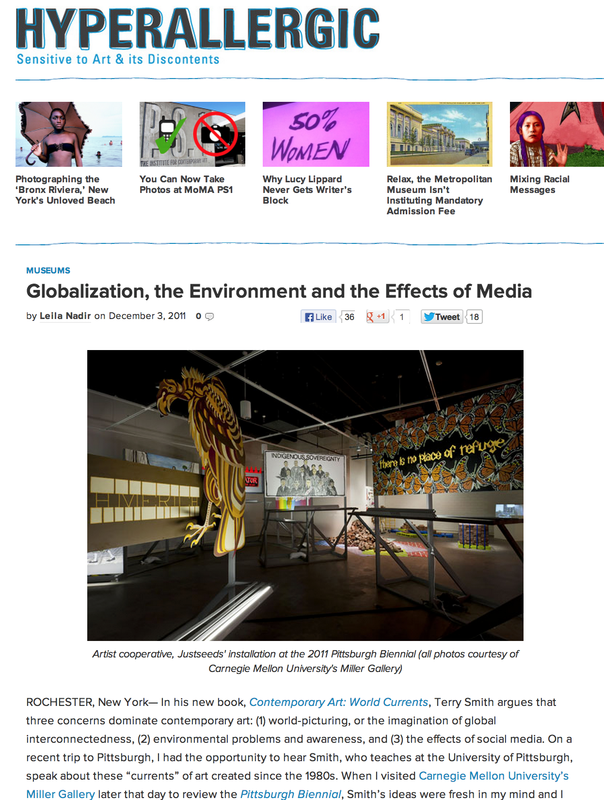 Through its redefinitions of place and space and trespassing of disciplinary boundaries into economics and science, the biennial contributes to the larger conversation going on within the major currents of contemporary art as defined by Smith: global connectivity, environmental issues and the effects of media. Part of the strength of this collection of works is its demonstration that art can not only visualize the problems we face on a global scale but can also inspire political participation and even further the critical dialogue about the role of art itself. Perhaps the artists’ commitment to collaboration, to working with others and negotiating their personal visions, is what makes this group so attentive to the infinite forms of interdependency that defines twenty-first century life—from gender and public/private domains, ecological sustainability, urban planning, the cultural commons and the political imagination.